A very important part in Ayahuasca Retreats is the psychological integration therapy which is a personalized therapy with every participant in the retreat. Here we help to the participants to learn how to integrate their own process of healing into their lives. This psychological integration is for every next morning after the ceremonies, and it is an individual process. 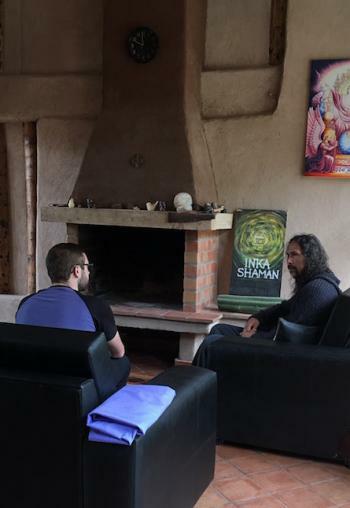 It means it is necessary to talk with every participant, a deep conversation trying to discover and to understand how to use the Ayahuasca experience as a tool for self-knowledge and inner growth. We need to talk deeply with every participant, and that is our main reason why we organize retreats with small groups. By using this psychological integration, it is not possible to work with more than 6 persons in a retreat. The idea is to learn a way how to integrate the experience lived during the non-ordinary state of consciousness, how to translate all the information received from the spiritual dimension and inner being to become it in part of the everyday life. For this purpose, it is used knowledges of Psychology from different approaches, knowledges from different traditions of wisdom and a deep commitment to help to the persons. According to our experience working with hundreds of participant in our ayahuasca retreats, we have learned and understood that for some persons it is easier to process their experiences by themselves, but it is not the case for everyone. For some persons it is really very difficult the Ayahuasca experience, and probably after the ceremonies someone might feel confused. In these cases, it is really very important to give support to understand what happened in the ceremony, and why the person is feeling in that way, what is necessary to do, and how to be able to use this experience in the most convenient way. A very important aspect of our method to work during the ayahuasca retreat is the Integration Therapy, which has several steps, first, we conduct a deep interview with each participant with the purpose of helping people to make a speech, through it, you are able to describe in detail your experiences, that is, to remember the emotions, perceptions and thoughts experienced during your participation in the ayahuasca session. It is also very important to help or support you, so that you can develop your own interpretation of the process, since in this way you will be able to integrate your experiences in your daily life. Part of our work is to provide all the necessary tools that will help you to know how it will be possible to continue working after the ayahuasca retreat ends, because if you have the intention of long-term results, it is necessary to learn an adequate psychological and spiritual training, and for that, we make all the necessary recommendations. Gabor Maté "suggested that while deep psychological dynamics may emerge into awareness during ayahuasca ceremonies, their therapeutic potential depends on trained guidance to bring these potentials to fruition. Successful treatment with ayahuasca requires an experienced person to provide structure and guidance to effectively orient to the visions, the therapeutic purpose, and the development of the experience across sessions. Lacking qualified assistance in achieving their full integration, important experiences may not produce benefits." In this sense, we have been developing our psychological integration therapy during a long period of time, training to ourselves with different shamans from the jungle, guiding hundreds of ayahuasca ceremonies, and at the same time, learning about the structure of the soul and learning different approaches of psychology like deep analytical psychology, humanistic psychology, transpersonal psychology, third generation of behavioral and cognitive psychology (mindfulness, ACT, etc. ), and different techniques to work in a healing process. We can understand that psychoterapeutic effects of Ayahuasca not only depends on how deep is the experience in the ayahuasca ceremony or how rich are contents experienced, it depends mainly in the psychological integration of the process, it means how the insights gained during the experience are integrated into the daily life. It is also very important to know in what way to continue working after teh ceremony, it means to know in what way it will be possible to complement this process of healing, all these recommendations are given during the psychological integration.